Start the tour with an early morning diamond head hike. This is one of the "must do" hikes you visit this island. This volcanic crater was formed roughly 300,000 years ago. The US army build the trail at the start of 20th century that leads to a panoramic view from KoKo Head Volcano to Waikiki. We continue the tour with a drive through the beautiful and scenic east side of the island with a quick stop at Halona blowhole and Eternity beach. Our east side beach destination is Kailua beach. In our opinion this is the most beautiful and swim friendly beach on the island. The tour finishes with a beautiful walk through Byodo-In temple. We will pick you up at your hotel. Start hike Diamond head take about 1 hour to summit it and come back estimate 2-3 hours total hike. Continue drive to Kailua / Lanikai beach for swimming or get sunbathe for full one hour stop. On the way there enjoy a scenery of east side of the island. A quick stop at a famous blow hole and Eternity beach. 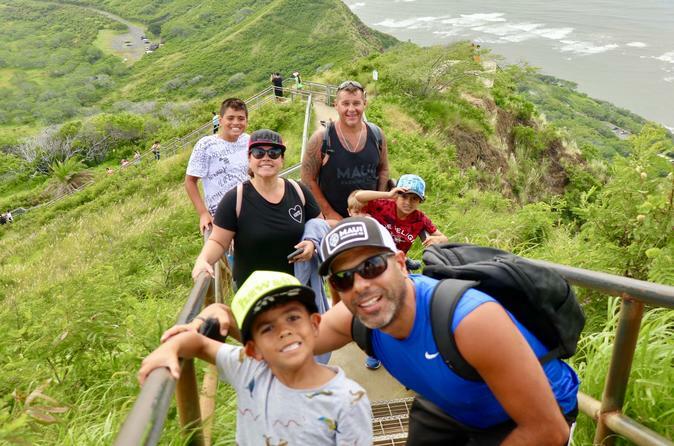 Sightseeing Makapu'u light house, rabbit island, sealife park and so much more. Last stop at Byodo-In temple valley walk through a peaceful scenery of history of a Japanese temple in Hawaii. The gems of the island is hidden in this beautiful valley. Enjoy feeding a koi fishes pond for a full one hour stop.